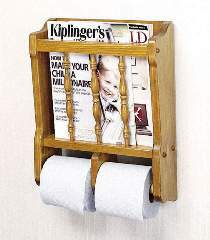 A magazine rack designed especially for the bathroom. Holds two rolls of toilet paper and has storage space for reading material. Patterns drawn FULL SIZE. Measures 12.25"W x 16"H x 4.25"D. Order hardware parts separately. Bathroom Magazine Rack Hardware Parts Package Package includes spindles, toilet paper rollers, screw hole buttons and screws. Project plan, wood and finish are not included.